Solar power is the largest among renewable energy sources. But, we don't have an efficient and cost effective technology to harness solar radiation. Now a days, experts are more confident than before and say that they can manipulate a cheap and efficient method to harness solar energy. Recently Massachusetts institute researchers had came up with a new idea to use old car batteries to make cheap solar panels. We can find more and more promising news updates about solar power from various research groups. In such a circumstances, you should be aware about the advantages and disadvantages of solar power. You are in the right place! Here we have a giant list of advantages of solar power for you. Use of traditional energy sources such as petroleum, coal liberates excess amount of oxides of carbon which leads to Green house effect. Global warming threatens the survival of human society, as well as the survival of countless species. Luckily, decades of research have led to efficient solar panel systems that create electricity without producing global warming pollution. Unlike Other renewable energy sources Solar energy plays zero threat to the environment. Solar panels also require little maintenance. After installation and optimization they are very reliable due to the fact that they actively create electricity in just a few millimeters and do not require any type of mechanical parts that can fail. Solar cells make absolutely no noise at all. They do not make a single peep while extracting useful energy from the sun. Solar power can provide constant and continuous power supply in until the Sun stops working. The rising and setting of the sun is extremely consistent. All across the world, we know exactly when it will rise and set every day of the year. While clouds may be a bit less predictable, we do also have fairly good seasonal and daily projections for the amount of sunlight that will be received in different locations. Solar energy can be used in remote areas where it is too expensive to extend the electricity power grid. It will also provide job security for local people. As a source of energy, solar power is a job-creating powerhouse. Money invested in solar power creates two to three times more jobs than money invested in coal or natural gas. Solar energy is getting more cost effective. The technology for solar energy is evolving at an increasing rate. At present photovoltaic technology is still relatively expensive but the technology is improving and production is increasing. Here is a comment appeared in an energy blog "I was not interested in solar panels since they are very expensive. But one week ago when I found an research report on Massachusetts IT website about building low cost solar panels I get really excited. Solar panels are easy to install and does not require any wires, cords or power sources. Unlike wind and geothermal power stations which require them to be tied with drilling machines, solar panels does not require them and can be installed on the rooftops which means no new space is needed and each home or business user can generate their own electricity. Solar power is a renewable source of energy with the most potential as it will continue to produce solar power as long as sun is there. Solar power produces no pollution, no voice pollution or emission, so environment friendly. Solar power is the the conversion of the energy from the sun to usable electricity. The most common source of solar power utilizes photovoltaic cells to convert sunlight into electricity. Photovoltaic utilize a semi-conductor to absorb the radiation from the sun, when the semi-conductor absorbs this radiation it emits electrons, which are harnessed as electricity. 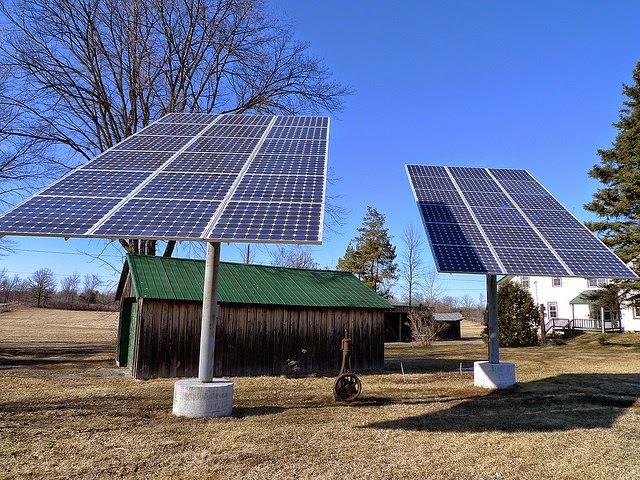 The initial cost of purchasing and installing solar panels always become the first disadvantage when the subject of comes up. Scientists has been researching on solar panels for several years to develop low devices. Few weeks ago Scientists at Massachusetts Institute of Technology have discovered Useless car batteries can be used to construct low cost solar cells. electricity for your home. In countries such as the UK, the unreliable climate means that solar energy is also unreliable as a source of energy. Batteries can be used to store solar power. Charge up the batteries on the sunny days and use that stored energy when the sun is hard to find. A few weeks ago we heard about a duel system that combines wind power and ocean current energy together. Such duel systems are applicable in the case of solar power in order to reduce intermittency. A working solar panel does not affect the environment. But a dead solar panel may harm environment. Most of the photovoltaic panels are made up of silicon and other toxic metals like mercury, lead and cadmium. We hope new innovative technologies can overcome the worst of these effects. Most commonly used solar panels are unable to absorb a lion share of the sun light falling on it. It reduces the efficiency of solar panel. Solar power stations can be built but they do not match the power output of similar sized conventional power stations. New emerging technologies however have increased the rate of efficiency of solar panels from 20 to 80 percent. Unlike home solar power system, a commercial system requires large area to install solar panels. You know, Solar power is the backdoor source of energy for most of the renewable energy sources. That's why advantages and disadvantages of solar power is very important. Express your opinions, comments, new points in the commenting section.